Home / Blog » Is Your Medical Website ADA Compliant? Is Your Medical Website ADA Compliant? Probably not. You may have heard about future website legislation requirements for Americans with visual and hearing disabilities. Do you know if your website is compliant? Here are answers to some common questions and how it may affect your website. The Americans with Disabilities Act, ADA, is a federal law passed in 1990 that aims to protect the rights of disabled people to ensure they are not discriminated against due to their disability. Most people are familiar with the physical accommodations by the ADA that businesses are required to make, such as automatic door openers and wheelchair ramps. Now these guidelines apply to the internet as well. In January 2018, ADA will be enforcing compliance on all virtual public properties, including websites. How Does This Affect Healthcare Websites? Does This Apply to My Practice? Yes, it does. The greater purpose of ADA is to ensure that people with disabilities have an equal opportunity to participate in the American way of life. This includes being able to access all the services and facilities provided on the internet. For ADA purposes, your website is viewed as part of the public domain, and should be compliant with this legislation. Fines for not making your website accessible can be as high as $75,000 per incidence. What Are Some Common Features of an ADA Compliant Website? ADA website compliance is about making sure that everyone has equal access to all the elements on your website and apps. That may mean you need to provide alternatives for some of the functions and content on your site to meet ADA website compliance standards. For example, easily resizable text with a high contrast mode option to make text easier to read for your sight impaired visitors. Photos should include text descriptions to ensure a blind person’s screen reader can identify the image. Videos should include audio descriptions and transcripts for people who are hard of hearing. The site should include text only functionality accessible through a keyboard for visitors with mobility issues. Yes. Upgrade your site now as this process can take up to 4 weeks. 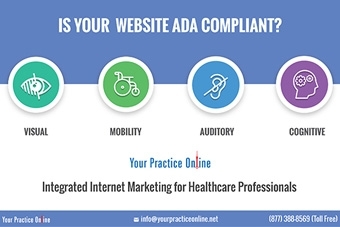 Your Practice Online is now offering our clients affordable ADA compliant website solutions, including educational videos with closed captions and text size options. 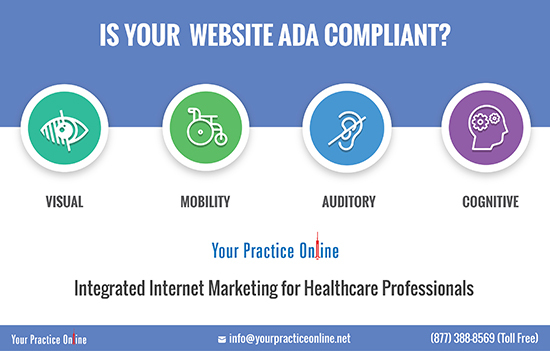 Contact us today at info@yourpracticeonline.net, or by calling (877) 388-8569 to upgrade your existing site, or build a new ADA compliant website.